With multiple installation options for drop-in models and an integral tile flange on alcove and apron models, KOHLER<sup></sup> ProFlex baths offer flexible solutions without additional expenses or lengthy modifications. Also available in store by special order only see store for details. Bathroom makeover is made easy with the MAAX Cocoon 6054 Hydrosens corner tub with smooth lines and decorative trim made from a durable high gloss acrylic that will shine and last for many years to come. Benefit from a stimulating and toning massage with the 6 fully adjustable SPA jets strategically located on the sides of the bathtub. The 6 directional and flow adjustable jets allow you to personalize your massage to soothe or energize specific areas and therefore get the experience you deserve. Control the intensity of the jets, from very gentle to very strong. Designed for podium installation, this tub features a large bathing well for two bathers, ergonomic headrests, as well as built-in armrests which all contribute to the comfortable experience. The time has come for a bathroom makeover? Why not choose the Keystone by MAAX Velvet 6054 whirlpool corner tub with 10 microjets! This whirlpool system offers a clean look and very effective massage thanks to its 10 discreet microjets. Strategically placed, these microjets provide an encompassing massage you will want to enjoy every day. Control the intensity of the jets, from very gentle to very strong. With its smooth lines, decorative moulding, and high gloss acrylic, this tub will be a definite eye catcher in your newly renovated bathroom. Designed for podium installation, this tub features a large bathing well for two bathers, ergonomic headrests, as well as built-in armrests which all contribute to the comfortable experience. Available in store by Special Order Only. See associate for details. 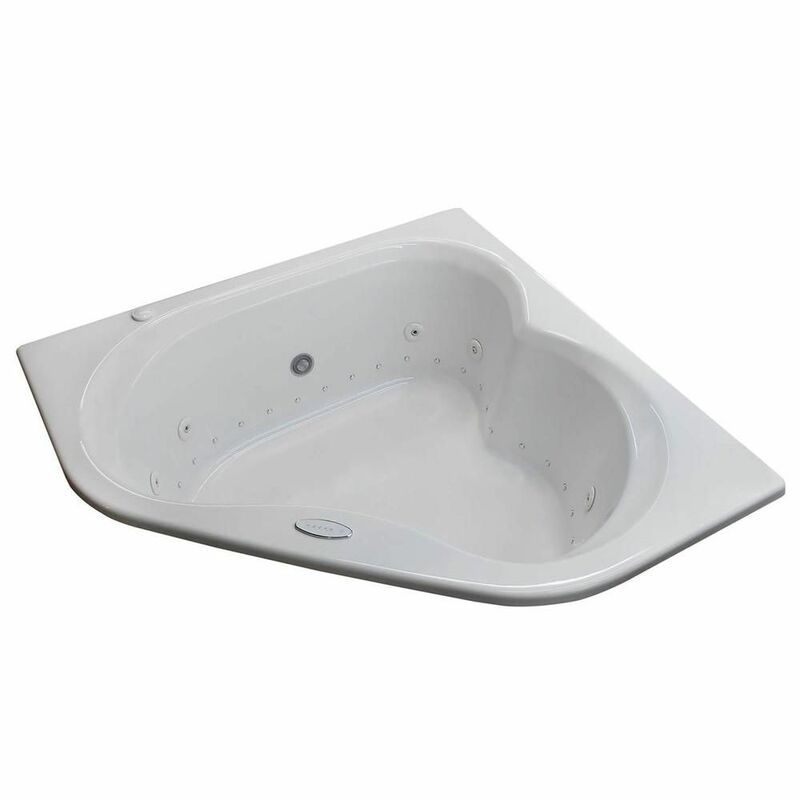 Beryl 5 Ft. Acrylic Drop-in Right Drain Corner Whirlpool and Air Bathtub in White Beryl series bathtubs feature a three-cockpit cradle opening, rounded interior edges for safety and luxury, stylish design, and a standard corner installation.